I have never shied away from sharing my walk with the Lord... whether it be my successes or failures. And I write because there may be others of you who are experiencing the same discontentment with the pace of your journey. So today I share where I'm at along my personal path. I am in a season of what I would describe as "teetering on a precipice"; of feeling that God has so much more for me to do, but He isn't revealing it to me, and I'm not sure why. He's not answering my questions, and my requests for more of the Holy Spirit seem to be falling on deaf ears. Yet, I know that I am not afraid to walk in bold obedience, or to go where He sends me. I don't think He is displeased with my work for His Kingdom, but why does our conversation seem to be lagging? Speak loudly that we may hear your Call. O lift our crosses with your almighty power. Help us fight off satan's lures. Permit your guiding hand not to tarry. Lord, forgive us and hold us to Thyself. You are our Lord! You are our King! In Adoration we all sing! You are Lord and King! ! ! There it is --- the fear that satan is driving a wedge between me and God; keeping me separated from His voice by some invisible barrier. Have I lived up to your expectations, Father, when you called me to Your service? Is this to be the limit of how much You can use me? Because I want to run the race with everything my flesh and soul and spirit have to offer! What is it that I am meant to do for You? This past weekend, I had the privilege of learning the origin and meaning of my father's surname and my mother's maiden name. From my father's side my last name was Ellison, meaning "son of Ellis", with Ellis being from the Greek name "Elias", or the Hebrew name "Eliyahu" meaning "Jehovah is God". Essentially, my family name comes to mean, "son of God". From my mother's side, I am descended from the last name Palmer. The surname Palmer was originally derived from the Old French word palmer, which was taken from the Latin word palmifer meaning palm bearer. In this case the original bearer of the surname was a pilgrim who carried palm branches back from the Holy Land. I was astounded that I carried such a strong legacy related to the Scriptures! So, naturally, I am left wondering if I am living up to those identities. But the weekend also afforded me the opportunity to speak to a man with great spiritual insight [after observing a training session on some higher spiritual mechanics that Mark and I are just tuning into). This man spoke prophetic words to me as if he could see into my heart. He said, "You are almost there! It's like there is a thin membrane between you and the Throne Room, and your face is making multiple imprints, like you are trying to break through saran wrap. You're asking so many questions, and not waiting for God to bring you an answer before you are on to your next question. Relax! Quit thinking so much! Rest! 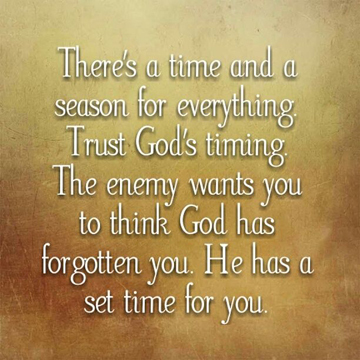 You will get your answers -- and your breakthrough -- in His timing!" And just like Carmela's poem says ... I am to blame for the position I find myself in. I'm too impatient and want to run ahead of where God wants to take me. About eight years ago, another man gave me a message that I was to write for God, and then he told me he had a Scripture that I should hold close to my heart. It is Isaiah 40:31: But those who wait for the Lord [who expect, look for, and hope in Him] will gain new strength and renew their power; They will lift up their wings [and rise up close to God] like eagles [rising toward the sun]; They will run and not become weary, They will walk and not grow tired. Obviously, I have not buried that verse deep enough into my heart. Lord, help me to walk before I run, so that I do not become weary for the long road before me. Help me to understand and expect that You will bring new strength and new power to me -- when You are ready to give it to me ... and when I am ready to receive it. And, Jesus, if there is more for me to do, I will gladly accept it. But if I am thinking too highly of myself, then humble me so that I might be content with whatever assignment You give me. I do not think my work is done, but I am willing to wait for You to show me if that is true or not. Until then, I will praise You for where You've taken me so far, and what You have shown me of Your awesome Kingdom. I will continue to write of Your Goodness and persist in my obedience to Your call on my life. But I have to tell you that I will never stop seeking You, nor knocking on that door to Your throne room. I may not bear the righteous fruit of my family names, but I will remain a servant of my Lord through eternity, ready to do the good works You have prepared for me. In gratitude and praise, I thank You! UPDATE: It may be a few days before I post again, due to Hurricane Harvey. We are in the crosshairs of this hurricane, and we have boarded up, and expecting lots of winds and torrential rain, and possible loss of power for several days. We are praying for the blood of Jesus to cover us, our animals, and our property. Your prayers are appreciated! Psalm 62:5 "For God alone, O my soul, wait in silence, for my hope is from Him". Pam, so Isaiah 40:31 was also the scripture given to me. It was the first one and the prophet speaking it said, 'New Things, New Things, New Things! Like he was trying to get my attention because I was going so fast and He knew if he and God did not repeat it I wouldn't be able to hear because I was so busy all the time. Like Martha rather than the 'good part' that Mary found. Sounds like there may be more than one reason God is connecting Mark and you up with me , at least for the moment and we will watch Him work out the details of what's next but first I must tell you how God got me to slow down and it was through my wife. I was a workaholic. In fact the last few years of my business career I could not stop hearing the song in my head, RUSHING, RUSHING AND I DONT KNOW WHY...(but not the song but just those first words over and over and over.). Then, when I was building this endtime super self contained all in one unique one of a kind MILLENIUM garden of Eden and God stopped me with, 'submit to your wife' who was not on board with all my preparations and today it's only half finished , BUT God .... had His plan I am seeing or beginning to see now, once He got me listening and taking time to hear and spend more time in His Presence than I do on the farm anymore. What He is sharing with me now about why He stopped me from doing that is He has something better planned and if I would do it then I would be tempted to be proud of what I had done and He wants all the honor and glory. Of course, I do too. I think those nagging little voices in my head telling me I've got to 'do something for God' or 'you've just become a lazy bum' are the doubts, fears and disbelief which satans minions are directed at me to train me to take dominion over my mind, my emotions and my will. The warning I received came from the scripture, if you are wearied with the footmen, how will you run when the horsemen arrive? I believe He is stripping us of all incumbencies of the flesh so that we will be spiritually dripping with oil and have rivers of living water flowing out of us more than enough for this end time harvest of souls that must be upon us very very soon. I've never seen so many believers being shaken and watched so many normal people becoming bold and beginning to roar so loudly. Now, I know that you probably feel like you're not roaring because of what you're in but I was speaking in the spirit because I've seen you and Mark and what y'all are going to be doing is vitally important and I believe He is going to be adding unto you..., in some way, whether it is material, yes, that too, but moreso, an adding to of minister or ministering or men ministering( I was hearing all three in the spirit so pray for more discernment there). As I read your comment, I recognized myself and those lying voices in my head ... I've always got to be advancing my walk with God and my work for Him, or I'm not becoming all He wants me to be. Instead, I know He wants me to slow down and get in step with Him, instead of directing myself. Thanks for giving me that clarification! Also, Mark says he recognizes what you are saying, too ... The Father is trying to move His Church off of the eschatology/end times/prepper mindset and into a Kingdom model. We cannot do Kingdom work if we are worried about the world ending. In other words, we hinder ourselves from changing the world if we are constantly worried about it ending. Pam, one more thought, as I was rereading Isaiah 40:31scripture, the running is first. The walking is second. As we slow down, or could it be said that, as He slows us down, then He can get us to walk with Him. And remember where the Spirit of God is, there is victory. That is His strategy of how He wants to use us to bring victory to Himself. This is so revealing.... I need to walk with Him, instead of running ahead of Him and looking back at Him, wondering why we're not in step! Thank you!